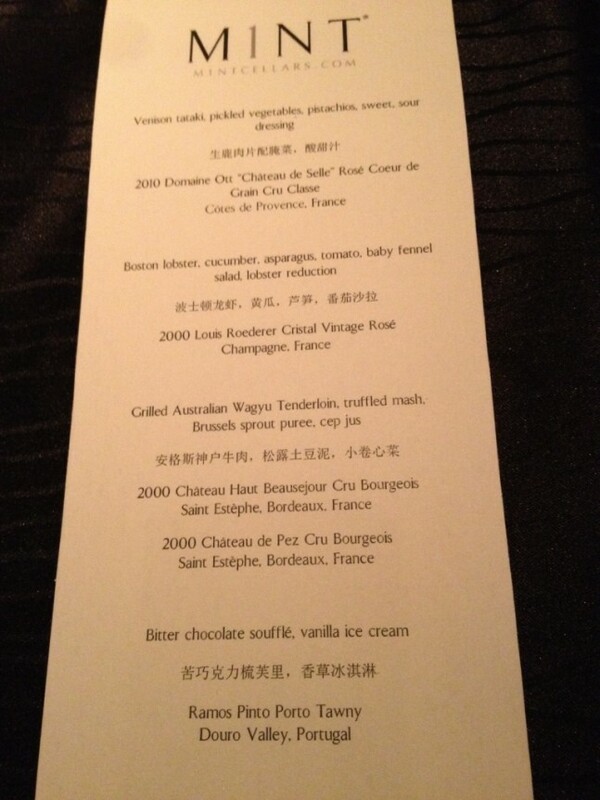 Millennium fever hit Shanghai last week, with a glorious celebration of infamous Champagne House Louis Roederer. I was fortunate enough to be a member of a select group who were invited to share the precious gifts Domaine Louis Roederer offers. Readers no doubt know enough about Roederer without me having to bestow upon them a history lesson. 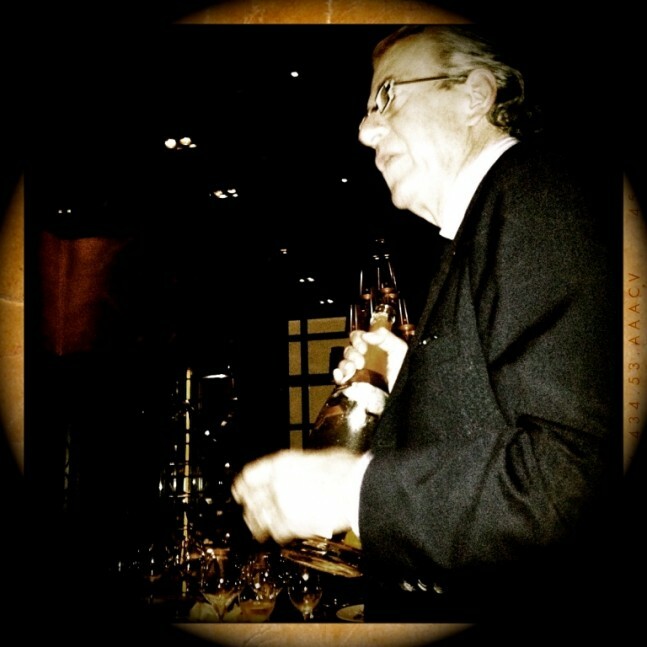 In town to pour the last Magnum of 2000 Cristal Rose in Mainland China was Vice President Michel Janneau, whose colourful and enthusiastic advice was not to listen to a series of tasting notes and lectures, but to allow the essence of these champagnes and wines speak for themselves. Here, here. The venue for this occasion was the intimate cellar dining room of M1NT Restaurant. M1NT’s menu is best described as progressive grill with traditional favorites like steamed Boston Lobster, Miso Black Cod and Wagyu Steak accompanied by Asian infused side dishes. Things have a way of coming full circle. Back in 2000, I had shared a 1978 Cristal with a select group on New Year’s Eve, wondering if the world was about to end when the clock struck twelve, such was the fear and paranoia about the clicking over to the new millennium. What better way to go, we thought, than sharing this magnificent vintage. So it was with a sense of nostalgia that the 2000 Cristal Rose was enjoyed last week. The assembled wines and champagne was an intimate portrait of the Roederer portfolio and almost all from the 2000 vintage. Of course, to start proceedings, the Brut Premier was poured, as gorgeously refreshing as ever; this has to be in the small band of elite NVs in the world – bready, effervescent, some lovely apple and toast…such complexity. 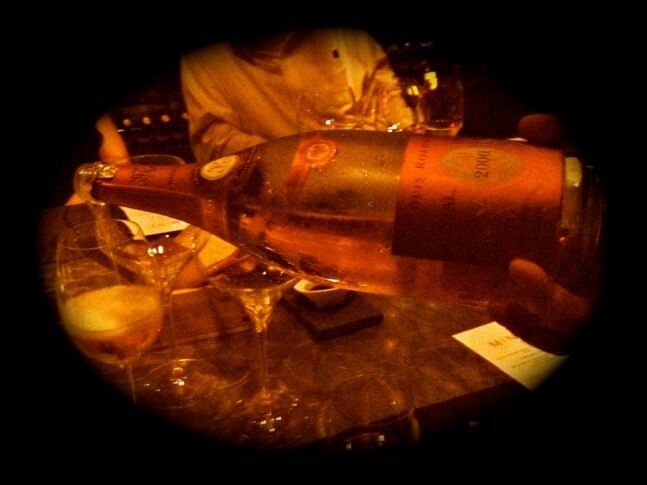 Once seated, we were served the Rose from Roederer’s estate in Provence, the 2010 Domaine Ott ‘Chateau de Selle’ Rose. Gorgeous salmon colour, this rose has some candied peach/strawberry – like fruit and lovely sweet spring floral notes which lifts the wine beyond many from this region. It proved a lovely accompaniment to the Venison tartare. The Cristal was next and showing gloriously! Matched with a sublime Lobster, the 2000 Rose is drinking superbly. Of course being in Magnum there was still youthful vibrancy and zing, the core of gentle acid running through the champagne marrying the complex, round and harmonious palate. It is intense and fresh champagne with a full expression of candied citrus, red fruits, some toasted dried fruit, almonds and honey. Stunningly balanced, it is long and broadly textured. It lifted the course to a new dimension, bringing out and enhancing many of the delicate creamy flavours of the Boston lobster and the saltiness of the caviar. 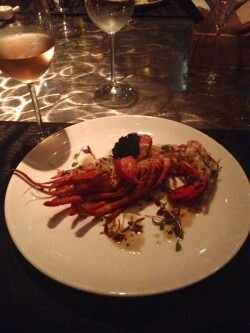 Louis Roederer Cristal Rose 2000 and Lobster - Sublime! Michel regards this vintage fondly. Driving rains, hailstorms and periodic threats from Mother Nature threatened to turn this into a disaster vintage, but he speaks heroically of the efforts made in the vineyard to harness the conditions and craft a champagne of amazing quality. Lovers of both Roederer and Bordeaux will be very familiar with their acquisition of both Chateau de Pez and Château Haut-Beauséjour. The 2000 vintages of both were poured side by, an intriguing comparison. The Château de Pez estate covers more than 26 hectares. Of these, 45% are planted with Cabernet Sauvignon, 44% with Merlot, 8% with Cabernet Franc and 3% with Petit Verdot. The wines are left to ferment in traditional oak vats before being blended and left to develop for a period of 16 to 18 months in oak barrels, 40% of them new. The 2000 de Pez offered glowing red fruits, quite dark and brambly nose, but balanced with some lovely cedar and spice. The wine is humming at the minute…at its peak or near to I suggest, but showing no signs of this being a small plateau. It’s long, harmonious and complete. Blended from a variety of different grapes grown on the estate, Château Haut-Beauséjour contains 52% Merlot, 40% Cabernet Sauvignon, 5% Petit Verdot and 3% Côt. After the assemblage, the wine is left to develop for 12 months in barrels made from oaks grown in central France, 30% of which are new. The wine rests for a further 12 months in the bottle before being finally marketed. It is a softer, somewhat more fruit driven wine than the Chateau de Pez, but drinking beautifully, having softened and mellowed into a cohesive balanced wine. Roederer regard this as the best they have produced of this wine, remarkable considering the vintage stress and complications 2000 threw up. Both wines were served with M1NT’s signature Australian wagyu beef with a reduction jus, mash, greens and root vegetables, which was the perfect accompaniment. Indeed, the modest head chef, who oversees a restaurant of 160 covers at a sitting was ushered out much to his embarrassment, but to well deserved acclaim. The wine and food pairings were deftly judged. Roederer weren’t finished, their Ramos Pinto vineyard in Douro produces a range of excellent ports, and the tawny port served with an immaculate bitter chocolate soufflé was inspired; toffee, caramelized dates, roasted coffee and a nutty sweet spirit. 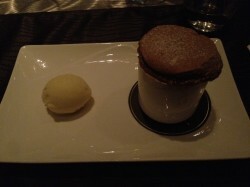 I am not usually a dessert person; but this was exceptional, and I intend to always leave room in future when I next dine at M1NT for that soufflé! As far as dinners go, the food at M1NT deserves wide acclaim. It really is well worth seeking out on your next visit to Shanghai, or if you are fortunate enough to live here, do make a reservation soon and be astounded at the excellent quality of produce, presentation and culinary skill being executed daily. This is my fifth time dining at M1NT and I cannot recommend it any higher. Simply superb! And finally – to Roederer, I was fortunate enough to visit the House of Roederer in 1994. Quite some time ago, I know. The quality, the sheer excellence of the champagnes poured that day over a tasting and a subsequent lunch in the heart of Reims shall live long. So to be in Shanghai, share the last bottle of this wonderful Cristal Rose from a classic vintage, was something else. To be with Michel and hear the wonderful stories of history, of this particular vintage, its nuances, its particular circumstances that threw up unique challenges, only enhanced the wine and champagne. 2000 certainly was a rare beast…producing fear, panic, even paranoia, but then also managing to etch out of the millennium mindset a brace of stunning wines that are all drinking superbly in the new era. The restaurant is perched on the top floor of M1NT Tower with imposing views of The Bund and Shanghai’s dramatic skyline. Seating 160 guests and set with an open theatre kitchen, funky music and stunning decor they strive to uphold the title of one of the best dining experiences in China. M1NT Restaurant is open daily from 6pm. For Reservation requests please email bookings@m1ntglobal.com or call +8621 6391 2811.